Strela-1 prototype. Later spacecraft in the series are believed to be similar in appearance. Russian military store-dump communications satellite. Military Communication, store dump satellite, Russia. Launched 1970 - 1994. AKA: 11F610. Status: Operational 1970. First Launch: 1970-06-27. Last Launch: 1994-12-20. Number: 52 . Gross mass: 900 kg (1,980 lb). Height: 3.00 m (9.80 ft). Span: 2.04 m (6.68 ft). 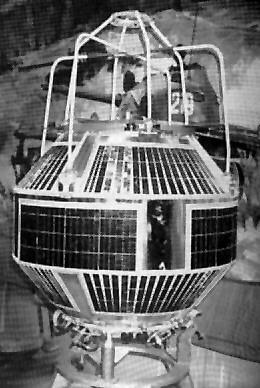 The Strela communications system consisted of a large constellation of medium orbit store-dump satellites that provided survivable communications for Soviet military and intelligence forces. The larger Strela-2M model provided encrypted communications for theatre military forces. Strela-2M's were launched one at a time by Kosmos 3M launch vehicles into orbits at 800 km altitude in three orbital planes inclined 74 degrees to the equator and spaced 120 degrees apart. The system was developed experimentally in the 1960's, with flight tests from 1965. Reshetnev was the chief designer in collaboration with the KB Krasnoyarsk Radio-Technical Factory (V G Taranenko) and MNIIRS MPSS (Yu S Bikov). The Strela-2M used the communications satellite bus KAUR-1. Flight tests of the operational system began in 1970. Production system work began in 1972. In 1974 the Strela 2M system was accepted by the military. In the period 1970 to 1994 a total of 59 Strela-2M's were launched. The satellites could be monitored in the West by their characteristic continuous wave beacon at 153.660 MHz. After 1994 the Strela-3 replaced both the Strela-1M and Strela-2M in service. 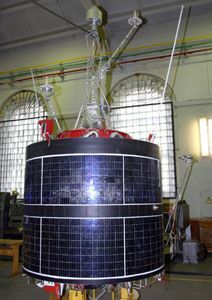 Strela-2M used the basic KAUR-1 bus, consisting of a 2.035 m diameter cylindrical spacecraft body, with solar cells and radiators of the thermostatic temperature regulating system mounted on the exterior. Orientation was by a single-axis magneto-gravitational (gravity gradient boom) passive system. The hermetically sealed compartment had the equipment mounted in cruciform bays, with the chemical batteries protecting the radio and guidance equipment mounted at the center. In service Strela-2M exhibited a lifetime of 24 to 36 months. Family: Communications, Medium earth orbit, Military store-dump comsat. Country: Russia. Launch Vehicles: R-14, Kosmos 3, Kosmos 11K65M. Projects: Strela. Launch Sites: Plesetsk, Plesetsk LC132/2, Plesetsk LC132/1, Plesetsk LC133/3. Agency: MO, Reshetnev bureau. Bibliography: 102, 2, 279, 445, 450, 6, 13229. 1970 June 27 - . 07:40 GMT - . Launch Site: Plesetsk. Launch Complex: Plesetsk LC132/1. LV Family: R-14. Launch Vehicle: Kosmos 11K65M. FAILURE: Launch vehicle failed to orbit - unknown cause.. Failed Stage: U.
Strela-2 - . Mass: 900 kg (1,980 lb). Nation: Russia. Agency: RVSN. Program: Strela. Class: Communications. Type: Military store-dump communications satellite. Spacecraft Bus: KAUR-1. Spacecraft: Strela-2M. 1970 October 16 - . 14:59 GMT - . Launch Site: Plesetsk. Launch Complex: Plesetsk LC132/1. LV Family: R-14. Launch Vehicle: Kosmos 11K65M. Cosmos 372 - . Mass: 750 kg (1,650 lb). Nation: Russia. Agency: MO. Program: Strela. Class: Communications. Type: Military store-dump communications satellite. Spacecraft Bus: KAUR-1. Spacecraft: Strela-2M. USAF Sat Cat: 4588 . COSPAR: 1970-086A. Apogee: 787 km (489 mi). Perigee: 767 km (476 mi). Inclination: 74.10 deg. Period: 100.40 min. 1971 April 23 - . 11:30 GMT - . Launch Site: Plesetsk. Launch Complex: Plesetsk LC132/1. LV Family: R-14. Launch Vehicle: Kosmos 11K65M. Cosmos 407 - . Mass: 750 kg (1,650 lb). Nation: Russia. Agency: MO. Program: Strela. Class: Communications. Type: Military store-dump communications satellite. Spacecraft Bus: KAUR-1. Spacecraft: Strela-2M. USAF Sat Cat: 5174 . COSPAR: 1971-035A. Apogee: 800 km (490 mi). Perigee: 773 km (480 mi). Inclination: 74.00 deg. Period: 100.60 min. 1971 December 17 - . 13:00 GMT - . Launch Site: Plesetsk. Launch Complex: Plesetsk LC132/2. LV Family: R-14. Launch Vehicle: Kosmos 11K65M. Cosmos 468 - . Mass: 750 kg (1,650 lb). Nation: Russia. Agency: MO. Program: Strela. Class: Communications. Type: Military store-dump communications satellite. Spacecraft Bus: KAUR-1. Spacecraft: Strela-2M. USAF Sat Cat: 5705 . COSPAR: 1971-114A. Apogee: 789 km (490 mi). Perigee: 768 km (477 mi). Inclination: 74.00 deg. Period: 100.40 min. 1972 June 23 - . 09:24 GMT - . Launch Site: Plesetsk. Launch Complex: Plesetsk LC132/2. LV Family: R-14. Launch Vehicle: Kosmos 11K65M. Cosmos 494 - . Mass: 750 kg (1,650 lb). Nation: Russia. Agency: MO. Program: Strela. Class: Communications. Type: Military store-dump communications satellite. Spacecraft Bus: KAUR-1. Spacecraft: Strela-2M. USAF Sat Cat: 6059 . COSPAR: 1972-043A. Apogee: 786 km (488 mi). Perigee: 772 km (479 mi). Inclination: 74.10 deg. Period: 100.40 min. 1972 October 17 - . Launch Site: Plesetsk. Launch Complex: Plesetsk LC132/1. LV Family: R-14. Launch Vehicle: Kosmos 11K65M. FAILURE: Launch vehicle failed to orbit - unknown cause.. Failed Stage: U. 1972 December 25 - . 23:05 GMT - . Launch Site: Plesetsk. Launch Complex: Plesetsk LC132/2. LV Family: R-14. Launch Vehicle: Kosmos 11K65M. Cosmos 540 - . Mass: 750 kg (1,650 lb). Nation: Russia. Agency: MO. Program: Strela. Class: Communications. Type: Military store-dump communications satellite. Spacecraft Bus: KAUR-1. Spacecraft: Strela-2M. USAF Sat Cat: 6323 . COSPAR: 1972-104A. Apogee: 790 km (490 mi). Perigee: 763 km (474 mi). Inclination: 74.10 deg. Period: 100.40 min. 1973 December 4 - . 15:00 GMT - . Launch Site: Plesetsk. Launch Complex: Plesetsk LC132/2. LV Family: R-14. Launch Vehicle: Kosmos 11K65M. Cosmos 614 - . Mass: 750 kg (1,650 lb). Nation: Russia. Agency: MO. Program: Strela. Class: Communications. Type: Military store-dump communications satellite. Spacecraft Bus: KAUR-1. Spacecraft: Strela-2M. USAF Sat Cat: 6965 . COSPAR: 1973-098A. Apogee: 787 km (489 mi). Perigee: 751 km (466 mi). Inclination: 74.10 deg. Period: 100.20 min. 1974 September 11 - . 17:40 GMT - . Launch Site: Plesetsk. Launch Complex: Plesetsk LC132/2. LV Family: R-14. Launch Vehicle: Kosmos 11K65M. Cosmos 676 - . Mass: 750 kg (1,650 lb). Nation: Russia. Agency: MO. Program: Strela. Class: Communications. Type: Military store-dump communications satellite. Spacecraft Bus: KAUR-1. Spacecraft: Strela-2M. USAF Sat Cat: 7433 . COSPAR: 1974-071A. Apogee: 798 km (495 mi). Perigee: 779 km (484 mi). Inclination: 74.00 deg. Period: 100.60 min. 1975 September 30 - . 18:38 GMT - . Launch Site: Plesetsk. Launch Complex: Plesetsk LC132/1. LV Family: R-14. Launch Vehicle: Kosmos 11K65M. Cosmos 773 - . Mass: 750 kg (1,650 lb). Nation: Russia. Agency: MO. Program: Strela. Class: Communications. Type: Military store-dump communications satellite. Spacecraft Bus: KAUR-1. Spacecraft: Strela-2M. USAF Sat Cat: 8343 . COSPAR: 1975-094A. Apogee: 790 km (490 mi). Perigee: 772 km (479 mi). Inclination: 74.10 deg. Period: 100.50 min. 1975 November 28 - . 00:10 GMT - . Launch Site: Plesetsk. Launch Complex: Plesetsk LC132/1. LV Family: R-14. Launch Vehicle: Kosmos 11K65M. Cosmos 783 - . Mass: 750 kg (1,650 lb). Nation: Russia. Agency: MO. Program: Strela. Class: Communications. Type: Military store-dump communications satellite. Spacecraft Bus: KAUR-1. Spacecraft: Strela-2M. USAF Sat Cat: 8458 . COSPAR: 1975-112A. Apogee: 797 km (495 mi). Perigee: 779 km (484 mi). Inclination: 74.10 deg. Period: 100.60 min. 1976 June 29 - . 08:12 GMT - . Launch Site: Plesetsk. Launch Complex: Plesetsk LC132/2. LV Family: R-14. Launch Vehicle: Kosmos 11K65M. Cosmos 836 - . Mass: 750 kg (1,650 lb). Nation: Russia. Agency: MO. Program: Strela. Class: Communications. Type: Military store-dump communications satellite. Spacecraft Bus: KAUR-1. Spacecraft: Strela-2M. USAF Sat Cat: 8923 . COSPAR: 1976-061A. Apogee: 801 km (497 mi). Perigee: 773 km (480 mi). Inclination: 74.10 deg. Period: 100.60 min. 1976 July 15 - . 13:11 GMT - . Launch Site: Plesetsk. Launch Complex: Plesetsk LC132/1. LV Family: R-14. Launch Vehicle: Kosmos 11K65M. Cosmos 841 - . Mass: 750 kg (1,650 lb). Nation: Russia. Agency: MO. Program: Strela. Class: Communications. Type: Military store-dump communications satellite. Spacecraft Bus: KAUR-1. Spacecraft: Strela-2M. USAF Sat Cat: 9022 . COSPAR: 1976-069A. Apogee: 789 km (490 mi). Perigee: 769 km (477 mi). Inclination: 74.00 deg. Period: 100.40 min. 1976 September 29 - . 07:04 GMT - . Launch Site: Plesetsk. Launch Complex: Plesetsk LC132/2. LV Family: R-14. Launch Vehicle: Kosmos 11K65M. Cosmos 858 - . Mass: 750 kg (1,650 lb). Nation: Russia. Agency: MO. Program: Strela. Class: Communications. Type: Military store-dump communications satellite. Spacecraft Bus: KAUR-1. Spacecraft: Strela-2M. USAF Sat Cat: 9443 . COSPAR: 1976-098A. Apogee: 794 km (493 mi). Perigee: 774 km (480 mi). Inclination: 74.10 deg. Period: 100.50 min. 1977 July 1 - . 11:52 GMT - . Launch Site: Plesetsk. Launch Complex: Plesetsk LC132/1. LV Family: R-14. Launch Vehicle: Kosmos 11K65M. Cosmos 923 - . Mass: 750 kg (1,650 lb). Nation: Russia. Agency: MO. Program: Strela. Class: Communications. Type: Military store-dump communications satellite. Spacecraft Bus: KAUR-1. Spacecraft: Strela-2M. USAF Sat Cat: 10120 . COSPAR: 1977-059A. Apogee: 800 km (490 mi). Perigee: 781 km (485 mi). Inclination: 74.00 deg. Period: 100.70 min. 1977 December 16 - . 04:25 GMT - . Launch Site: Plesetsk. Launch Complex: Plesetsk LC132/1. LV Family: R-14. Launch Vehicle: Kosmos 11K65M. Cosmos 968 - . Mass: 750 kg (1,650 lb). Nation: Russia. Agency: MO. Program: Strela. Class: Communications. Type: Military store-dump communications satellite. Spacecraft Bus: KAUR-1. Spacecraft: Strela-2M. USAF Sat Cat: 10520 . COSPAR: 1977-119A. Apogee: 791 km (491 mi). Perigee: 765 km (475 mi). Inclination: 74.00 deg. Period: 100.40 min. 1978 February 17 - . 16:33 GMT - . Launch Site: Plesetsk. Launch Complex: Plesetsk LC132/2. LV Family: R-14. Launch Vehicle: Kosmos 11K65M. Cosmos 990 - . Mass: 750 kg (1,650 lb). Nation: Russia. Agency: MO. Program: Strela. Class: Communications. Type: Military store-dump communications satellite. Spacecraft Bus: KAUR-1. Spacecraft: Strela-2M. USAF Sat Cat: 10676 . COSPAR: 1978-019A. Apogee: 791 km (491 mi). Perigee: 764 km (474 mi). Inclination: 74.00 deg. Period: 100.40 min. 1978 June 21 - . 09:27 GMT - . Launch Site: Plesetsk. Launch Complex: Plesetsk LC132/1. LV Family: R-14. Launch Vehicle: Kosmos 11K65M. Cosmos 1023 - . Mass: 750 kg (1,650 lb). Nation: Russia. Agency: MO. Program: Strela. Class: Communications. Type: Military store-dump communications satellite. Spacecraft Bus: KAUR-1. Spacecraft: Strela-2M. USAF Sat Cat: 10961 . COSPAR: 1978-063A. Apogee: 786 km (488 mi). Perigee: 766 km (475 mi). Inclination: 74.10 deg. Period: 100.40 min. 1978 November 16 - . 21:45 GMT - . Launch Site: Plesetsk. Launch Complex: Plesetsk LC132/2. LV Family: R-14. Launch Vehicle: Kosmos 11K65M. Cosmos 1048 - . Mass: 750 kg (1,650 lb). Nation: Russia. Agency: MO. Program: Strela. Class: Communications. Type: Military store-dump communications satellite. Spacecraft Bus: KAUR-1. Spacecraft: Strela-2M. USAF Sat Cat: 11111 . COSPAR: 1978-105A. Apogee: 797 km (495 mi). Perigee: 769 km (477 mi). Inclination: 74.00 deg. Period: 100.50 min. 1979 June 28 - . 20:09 GMT - . Launch Site: Plesetsk. Launch Complex: Plesetsk LC132/1. LV Family: R-14. Launch Vehicle: Kosmos 11K65M. Cosmos 1110 - . Mass: 750 kg (1,650 lb). Nation: Russia. Agency: MO. Program: Strela. Class: Communications. Type: Military store-dump communications satellite. Spacecraft Bus: KAUR-1. Spacecraft: Strela-2M. USAF Sat Cat: 11425 . COSPAR: 1979-060A. Apogee: 797 km (495 mi). Perigee: 775 km (481 mi). Inclination: 74.00 deg. Period: 100.60 min. 1979 August 28 - . 00:55 GMT - . Launch Site: Plesetsk. Launch Complex: Plesetsk LC132/1. LV Family: R-14. Launch Vehicle: Kosmos 11K65M. Cosmos 1125 - . Mass: 750 kg (1,650 lb). Nation: Russia. Agency: MO. Program: Strela. Class: Communications. Type: Military store-dump communications satellite. Spacecraft Bus: KAUR-1. Spacecraft: Strela-2M. USAF Sat Cat: 11510 . COSPAR: 1979-078A. Apogee: 795 km (493 mi). Perigee: 779 km (484 mi). Inclination: 74.00 deg. Period: 100.60 min. 1979 October 11 - . 16:36 GMT - . Launch Site: Plesetsk. Launch Complex: Plesetsk LC132/2. LV Family: R-14. Launch Vehicle: Kosmos 11K65M. Cosmos 1140 - . Mass: 750 kg (1,650 lb). Nation: Russia. Agency: MO. Program: Strela. Class: Communications. Type: Military store-dump communications satellite. Spacecraft Bus: KAUR-1. Spacecraft: Strela-2M. USAF Sat Cat: 11573 . COSPAR: 1979-089A. Apogee: 787 km (489 mi). Perigee: 765 km (475 mi). Inclination: 74.10 deg. Period: 100.40 min. 1980 July 1 - . 07:12 GMT - . Launch Site: Plesetsk. Launch Complex: Plesetsk LC132/2. LV Family: R-14. Launch Vehicle: Kosmos 11K65M. Cosmos 1190 - . Mass: 750 kg (1,650 lb). Nation: Russia. Agency: MO. Program: Strela. Class: Communications. Type: Military store-dump communications satellite. Spacecraft Bus: KAUR-1. Spacecraft: Strela-2M. USAF Sat Cat: 11869 . COSPAR: 1980-056A. Apogee: 792 km (492 mi). Perigee: 777 km (482 mi). Inclination: 74.00 deg. Period: 100.60 min. 1981 May 7 - . 13:21 GMT - . Launch Site: Plesetsk. Launch Complex: Plesetsk LC132/1. LV Family: R-14. Launch Vehicle: Kosmos 11K65M. Cosmos 1269 - . Mass: 750 kg (1,650 lb). Nation: Russia. Agency: MO. Program: Strela. Class: Communications. Type: Military store-dump communications satellite. Spacecraft Bus: KAUR-1. Spacecraft: Strela-2M. USAF Sat Cat: 12442 . COSPAR: 1981-041A. Apogee: 798 km (495 mi). Perigee: 781 km (485 mi). Inclination: 74.10 deg. Period: 100.70 min. 1981 August 28 - . 16:18 GMT - . Launch Site: Plesetsk. Launch Complex: Plesetsk LC132/1. LV Family: R-14. Launch Vehicle: Kosmos 11K65M. Cosmos 1302 - . Mass: 750 kg (1,650 lb). Nation: Russia. Agency: MO. Program: Strela. Class: Communications. Type: Military store-dump communications satellite. Spacecraft Bus: KAUR-1. Spacecraft: Strela-2M. USAF Sat Cat: 12791 . COSPAR: 1981-084A. Apogee: 796 km (494 mi). Perigee: 771 km (479 mi). Inclination: 74.00 deg. Period: 100.50 min. Replaced Cosmos 1269..
1982 January 7 - . 15:38 GMT - . Launch Site: Plesetsk. Launch Complex: Plesetsk LC132/2. LV Family: R-14. Launch Vehicle: Kosmos 11K65M. Cosmos 1331 - . Mass: 750 kg (1,650 lb). Nation: Russia. Agency: MO. Program: Strela. Class: Communications. Type: Military store-dump communications satellite. Spacecraft Bus: KAUR-1. Spacecraft: Strela-2M. USAF Sat Cat: 13027 . COSPAR: 1982-001A. Apogee: 795 km (493 mi). Perigee: 757 km (470 mi). Inclination: 74.10 deg. Period: 100.40 min. Replaced Cosmos 1302..
1982 April 28 - . 02:52 GMT - . Launch Site: Plesetsk. Launch Complex: Plesetsk LC132/1. LV Family: R-14. Launch Vehicle: Kosmos 11K65M. Cosmos 1354 - . Mass: 750 kg (1,650 lb). Nation: Russia. Agency: MO. Program: Strela. Class: Communications. Type: Military store-dump communications satellite. Spacecraft Bus: KAUR-1. Spacecraft: Strela-2M. USAF Sat Cat: 13148 . COSPAR: 1982-037A. Apogee: 798 km (495 mi). Perigee: 783 km (486 mi). Inclination: 74.00 deg. Period: 100.70 min. Replaced Cosmos 1190..
1982 June 1 - . 04:37 GMT - . Launch Site: Plesetsk. Launch Complex: Plesetsk LC132/1. LV Family: R-14. Launch Vehicle: Kosmos 11K65M. Cosmos 1371 - . Mass: 750 kg (1,650 lb). Nation: Russia. Agency: MO. Program: Strela. Class: Communications. Type: Military store-dump communications satellite. Spacecraft Bus: KAUR-1. Spacecraft: Strela-2M. USAF Sat Cat: 13241 . COSPAR: 1982-051A. Apogee: 801 km (497 mi). Perigee: 781 km (485 mi). Inclination: 74.00 deg. Period: 100.70 min. Replaced Cosmos 1140..
1982 August 30 - . 10:04 GMT - . Launch Site: Plesetsk. Launch Complex: Plesetsk LC132/2. LV Family: R-14. Launch Vehicle: Kosmos 11K65M. FAILURE: Launch vehicle failed to orbit - unknown cause.. Failed Stage: U.
Strela-2 - . Mass: 900 kg (1,980 lb). Nation: Russia. Agency: UNKS. Program: Strela. Class: Communications. Type: Military store-dump communications satellite. Spacecraft Bus: KAUR-1. Spacecraft: Strela-2M. 1982 November 11 - . 06:14 GMT - . Launch Site: Plesetsk. Launch Complex: Plesetsk LC132/1. LV Family: R-14. Launch Vehicle: Kosmos 11K65M. Cosmos 1420 - . Mass: 750 kg (1,650 lb). Nation: Russia. Agency: MO. Program: Strela. Class: Communications. Type: Military store-dump communications satellite. Spacecraft Bus: KAUR-1. Spacecraft: Strela-2M. USAF Sat Cat: 13648 . COSPAR: 1982-109A. Apogee: 800 km (490 mi). Perigee: 768 km (477 mi). Inclination: 74.00 deg. Period: 100.60 min. 1983 April 12 - . 18:20 GMT - . Launch Site: Plesetsk. Launch Complex: Plesetsk LC132/2. LV Family: R-14. Launch Vehicle: Kosmos 11K65M. Cosmos 1452 - . Mass: 750 kg (1,650 lb). Nation: Russia. Agency: MO. Program: Strela. Class: Communications. Type: Military store-dump communications satellite. Spacecraft Bus: KAUR-1. Spacecraft: Strela-2M. USAF Sat Cat: 13991 . COSPAR: 1983-031A. Apogee: 800 km (490 mi). Perigee: 774 km (480 mi). Inclination: 74.00 deg. Period: 100.60 min. Replaced Cosmos 1371..
1983 August 3 - . 12:40 GMT - . Launch Site: Plesetsk. Launch Complex: Plesetsk LC132/2. LV Family: R-14. Launch Vehicle: Kosmos 11K65M. Cosmos 1486 - . Mass: 750 kg (1,650 lb). Nation: Russia. Agency: MO. Program: Strela. Class: Communications. Type: Military store-dump communications satellite. Spacecraft Bus: KAUR-1. Spacecraft: Strela-2M. USAF Sat Cat: 14240 . COSPAR: 1983-079A. Apogee: 794 km (493 mi). Perigee: 775 km (481 mi). Inclination: 74.10 deg. Period: 100.60 min. Replaced Cosmos 1354..
1983 October 12 - . 00:20 GMT - . Launch Site: Plesetsk. Launch Complex: Plesetsk LC132/1. LV Family: R-14. Launch Vehicle: Kosmos 11K65M. Cosmos 1503 - . Mass: 750 kg (1,650 lb). Nation: Russia. Agency: MO. Program: Strela. Class: Communications. Type: Military store-dump communications satellite. Spacecraft Bus: KAUR-1. Spacecraft: Strela-2M. USAF Sat Cat: 14401 . COSPAR: 1983-103A. Apogee: 800 km (490 mi). Perigee: 779 km (484 mi). Inclination: 74.00 deg. Period: 100.70 min. Replaced Cosmos 1486..
1984 February 21 - . 15:36 GMT - . Launch Site: Plesetsk. Launch Complex: Plesetsk LC132/1. LV Family: R-14. Launch Vehicle: Kosmos 11K65M. Cosmos 1538 - . Mass: 700 kg (1,540 lb). Nation: Russia. Agency: MO. Program: Strela. Class: Communications. Type: Military store-dump communications satellite. Spacecraft Bus: KAUR-1. Spacecraft: Strela-2M. USAF Sat Cat: 14759 . COSPAR: 1984-019A. Apogee: 800 km (490 mi). Perigee: 769 km (477 mi). Inclination: 74.00 deg. Period: 100.60 min. Replaced Cosmos 1420..
1984 June 8 - . 11:28 GMT - . Launch Site: Plesetsk. Launch Complex: Plesetsk LC132/1. LV Family: R-14. Launch Vehicle: Kosmos 11K65M. Cosmos 1570 - . Mass: 750 kg (1,650 lb). Nation: Russia. Agency: MO. Program: Strela. Class: Communications. Type: Military store-dump communications satellite. Spacecraft Bus: KAUR-1. Spacecraft: Strela-2M. USAF Sat Cat: 15031 . COSPAR: 1984-056A. Apogee: 800 km (490 mi). Perigee: 782 km (485 mi). Inclination: 74.10 deg. Period: 100.70 min. Replaced Cosmos 1452..
1985 January 17 - . 17:46 GMT - . Launch Site: Plesetsk. Launch Complex: Plesetsk LC132/1. LV Family: R-14. Launch Vehicle: Kosmos 11K65M. Cosmos 1624 - . Mass: 700 kg (1,540 lb). Nation: Russia. Agency: MO. Program: Strela. Class: Communications. Type: Military store-dump communications satellite. Spacecraft Bus: KAUR-1. Spacecraft: Strela-2M. USAF Sat Cat: 15482 . COSPAR: 1985-006A. Apogee: 797 km (495 mi). Perigee: 777 km (482 mi). Inclination: 74.00 deg. Period: 100.60 min. Replaced Cosmos 1570..
1985 September 4 - . 07:05 GMT - . Launch Site: Plesetsk. Launch Complex: Plesetsk LC132/1. LV Family: R-14. Launch Vehicle: Kosmos 11K65M. Cosmos 1680 - . Mass: 700 kg (1,540 lb). Nation: Russia. Agency: MO. Program: Strela. Class: Communications. Type: Military store-dump communications satellite. Spacecraft Bus: KAUR-1. Spacecraft: Strela-2M. USAF Sat Cat: 16011 . COSPAR: 1985-079A. Apogee: 798 km (495 mi). Perigee: 774 km (480 mi). Inclination: 74.10 deg. Period: 100.60 min. Replaced Cosmos 1538..
1986 April 17 - . 21:02 GMT - . Launch Site: Plesetsk. Launch Complex: Plesetsk LC132/1. LV Family: R-14. Launch Vehicle: Kosmos 11K65M. Cosmos 1741 - . Mass: 700 kg (1,540 lb). Nation: Russia. Agency: MO. Program: Strela. Class: Communications. Type: Military store-dump communications satellite. Spacecraft Bus: KAUR-1. Spacecraft: Strela-2M. USAF Sat Cat: 16681 . COSPAR: 1986-030A. Apogee: 801 km (497 mi). Perigee: 773 km (480 mi). Inclination: 74.00 deg. Period: 100.60 min. Replaced Cosmos 1503..
1986 July 16 - . 04:21 GMT - . Launch Site: Plesetsk. Launch Complex: Plesetsk LC133/3. LV Family: R-14. Launch Vehicle: Kosmos 11K65M. Cosmos 1763 - . Mass: 700 kg (1,540 lb). Nation: Russia. Agency: MO. Program: Strela. Class: Communications. Type: Military store-dump communications satellite. Spacecraft Bus: KAUR-1. Spacecraft: Strela-2M. USAF Sat Cat: 16860 . COSPAR: 1986-052A. Apogee: 794 km (493 mi). Perigee: 749 km (465 mi). Inclination: 74.00 deg. Period: 100.30 min. 1986 September 10 - . 01:45 GMT - . Launch Site: Plesetsk. Launch Complex: Plesetsk LC133/3. LV Family: R-14. Launch Vehicle: Kosmos 11K65M. Cosmos 1777 - . Mass: 700 kg (1,540 lb). Nation: Russia. Agency: MO. Program: Strela. Class: Communications. Type: Military store-dump communications satellite. Spacecraft Bus: KAUR-1. Spacecraft: Strela-2M. USAF Sat Cat: 16952 . COSPAR: 1986-070A. Apogee: 803 km (498 mi). Perigee: 768 km (477 mi). Inclination: 74.00 deg. Period: 100.60 min. Replaced Cosmos 1624..
1987 January 21 - . 09:10 GMT - . Launch Site: Plesetsk. Launch Complex: Plesetsk LC132/2. LV Family: R-14. Launch Vehicle: Kosmos 11K65M. Cosmos 1814 - . Mass: 700 kg (1,540 lb). Nation: Russia. Agency: MO. Program: Strela. Class: Communications. Type: Military store-dump communications satellite. Spacecraft Bus: KAUR-1. Spacecraft: Strela-2M. USAF Sat Cat: 17303 . COSPAR: 1987-006A. Apogee: 799 km (496 mi). Perigee: 763 km (474 mi). Inclination: 74.10 deg. Period: 100.50 min. 1987 June 9 - . 14:45 GMT - . Launch Site: Plesetsk. Launch Complex: Plesetsk LC132/1. LV Family: R-14. Launch Vehicle: Kosmos 11K65M. Cosmos 1850 - . Mass: 700 kg (1,540 lb). Nation: Russia. Agency: MO. Program: Strela. Class: Communications. Type: Military store-dump communications satellite. Spacecraft Bus: KAUR-1. Spacecraft: Strela-2M. USAF Sat Cat: 18095 . COSPAR: 1987-049A. Apogee: 797 km (495 mi). Perigee: 776 km (482 mi). Inclination: 74.00 deg. Period: 100.60 min. 1987 December 1 - . 14:15 GMT - . Launch Site: Plesetsk. Launch Complex: Plesetsk LC133/3. Launch Pad: LC133/3?. LV Family: R-14. Launch Vehicle: Kosmos 11K65M. Cosmos 1898 - . Mass: 750 kg (1,650 lb). Nation: Russia. Agency: MO. Program: Strela. Class: Communications. Type: Military store-dump communications satellite. Spacecraft Bus: KAUR-1. Spacecraft: Strela-2M. USAF Sat Cat: 18585 . COSPAR: 1987-098A. Apogee: 800 km (490 mi). Perigee: 770 km (470 mi). Inclination: 74.00 deg. Period: 100.60 min. 1988 April 5 - . 14:41 GMT - . Launch Site: Plesetsk. Launch Complex: Plesetsk LC133/3. LV Family: R-14. Launch Vehicle: Kosmos 11K65M. Cosmos 1937 - . Mass: 700 kg (1,540 lb). Nation: Russia. Agency: MO. Program: Strela. Class: Communications. Type: Military store-dump communications satellite. Spacecraft Bus: KAUR-1. Spacecraft: Strela-2M. USAF Sat Cat: 19038 . COSPAR: 1988-029A. Apogee: 797 km (495 mi). Perigee: 761 km (472 mi). Inclination: 74.00 deg. Period: 100.40 min. 1988 June 21 - . 16:26 GMT - . Launch Site: Plesetsk. Launch Complex: Plesetsk LC133/3. LV Family: R-14. Launch Vehicle: Kosmos 11K65M. Cosmos 1954 - . Mass: 700 kg (1,540 lb). Nation: Russia. Agency: MO. Program: Strela. Class: Communications. Type: Military store-dump communications satellite. Spacecraft Bus: KAUR-1. Spacecraft: Strela-2M. USAF Sat Cat: 19256 . COSPAR: 1988-053A. Apogee: 796 km (494 mi). Perigee: 772 km (479 mi). Inclination: 74.00 deg. Period: 100.50 min. Outer space research. .
1989 January 26 - . 15:36 GMT - . Launch Site: Plesetsk. Launch Complex: Plesetsk LC132/2. LV Family: R-14. Launch Vehicle: Kosmos 11K65M. Cosmos 1992 - . Mass: 900 kg (1,980 lb). Nation: Russia. Agency: MO. Program: Strela. Class: Communications. Type: Military store-dump communications satellite. Spacecraft Bus: KAUR-1. Spacecraft: Strela-2M. USAF Sat Cat: 19769 . COSPAR: 1989-005A. Apogee: 798 km (495 mi). Perigee: 764 km (474 mi). Inclination: 74.10 deg. Period: 100.50 min. 1990 January 18 - . 12:52 GMT - . Launch Site: Plesetsk. Launch Complex: Plesetsk LC133/3. LV Family: R-14. Launch Vehicle: Kosmos 11K65M. Cosmos 2056 - . Mass: 900 kg (1,980 lb). Nation: Russia. Agency: MO. Program: Strela. Class: Communications. Type: Military store-dump communications satellite. Spacecraft Bus: KAUR-1. Spacecraft: Strela-2M. USAF Sat Cat: 20432 . COSPAR: 1990-004A. Apogee: 804 km (499 mi). Perigee: 768 km (477 mi). Inclination: 74.00 deg. Period: 100.60 min. 1990 December 10 - . 07:54 GMT - . Launch Site: Plesetsk. Launch Complex: Plesetsk LC133/3. LV Family: R-14. Launch Vehicle: Kosmos 11K65M. Cosmos 2112 - . Mass: 900 kg (1,980 lb). Nation: Russia. Agency: MO. Program: Strela. Class: Communications. Type: Military store-dump communications satellite. Spacecraft Bus: KAUR-1. Spacecraft: Strela-2M. USAF Sat Cat: 21014 . COSPAR: 1990-111A. Apogee: 807 km (501 mi). Perigee: 764 km (474 mi). Inclination: 74.00 deg. Period: 100.60 min. 1991 June 11 - . 05:41 GMT - . Launch Site: Plesetsk. Launch Complex: Plesetsk LC133/3. LV Family: R-14. Launch Vehicle: Kosmos 11K65M. Cosmos 2150 - . Mass: 900 kg (1,980 lb). Nation: Russia. Agency: MO. Program: Strela. Class: Communications. Type: Military store-dump communications satellite. Spacecraft Bus: KAUR-1. Spacecraft: Strela-2M. USAF Sat Cat: 21418 . COSPAR: 1991-041A. Apogee: 805 km (500 mi). Perigee: 778 km (483 mi). Inclination: 74.00 deg. Period: 100.70 min. 1992 August 12 - . 05:44 GMT - . Launch Site: Plesetsk. Launch Complex: Plesetsk LC132/1. LV Family: R-14. Launch Vehicle: Kosmos 11K65M. Cosmos 2208 - . Mass: 900 kg (1,980 lb). Nation: Russia. Agency: MO. Program: Strela. Class: Communications. Type: Military store-dump communications satellite. Spacecraft Bus: KAUR-1. Spacecraft: Strela-2M. USAF Sat Cat: 22080 . COSPAR: 1992-053A. Apogee: 803 km (498 mi). Perigee: 785 km (487 mi). Inclination: 74.00 deg. Period: 100.80 min. Still operating in 1995..
1993 June 16 - . 04:17 GMT - . Launch Site: Plesetsk. Launch Complex: Plesetsk LC132/1. LV Family: R-14. Launch Vehicle: Kosmos 11K65M. Cosmos 2251 - . Mass: 900 kg (1,980 lb). Nation: Russia. Agency: MO. Program: Strela. Class: Communications. Type: Military store-dump communications satellite. Spacecraft Bus: KAUR-1. Spacecraft: Strela-2M. USAF Sat Cat: 22675 . COSPAR: 1993-036A. Apogee: 803 km (498 mi). Perigee: 778 km (483 mi). Inclination: 74.00 deg. Period: 100.70 min. Replaced Cosmos 2112. Inactive when it collided with Iridium 33 at 16:56 GMT on 10 February 2009, destroying both satellites and creating a debris cloud im MEO..
1994 December 20 - . 05:11 GMT - . Launch Site: Plesetsk. Launch Complex: Plesetsk LC132/1. LV Family: R-14. Launch Vehicle: Kosmos 11K65M. Cosmos 2298 - . Mass: 900 kg (1,980 lb). Nation: Russia. Agency: MO. Program: Strela. Class: Communications. Type: Military store-dump communications satellite. Spacecraft Bus: KAUR-1. Spacecraft: Strela-2M. USAF Sat Cat: 23431 . COSPAR: 1994-083A. Apogee: 810 km (500 mi). Perigee: 785 km (487 mi). Inclination: 74.03 deg. Period: 100.83 min. Replaced Cosmos 2150. Final operational constellation was Cosmos 2208, 2251, and 2298..